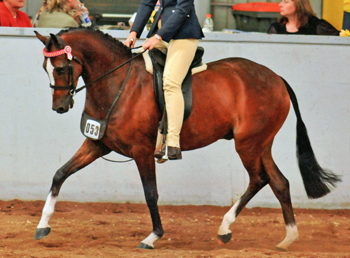 Home / Horse Stories » Barrys Back Competing! Barry was broken-in in March, 2009, at four years of age and quietly worked through the winter, attending some winter clinics. After shedding the winter woollies and going from the ugly duck to a beautiful swan, he was shown three times in August for a promising start with three Champions and one Supreme. Things looked good for his newcomer season. On the 1st of September things started to crash with Barry starting to get a bit scratchy, a subtle lameness that would seem worse on corners and not real evident which leg it was. We decided to put a set of shoes on just in case he was feeling the ground as it had started to harden up after the winter. Thinking it could be muscular we tried a few well respected horse masseurs with no real success. On one occasion, Don said he thought he had done all he could, that we should be looking lower down his leg for answers. A few weeks later it was decided to take him to the local equine hospital for investigation. By this time a very small splint had appeared on his off fore leg. Our show season was starting to look in jeopardy. On the 29th of September Barry had a lameness work up with nerve blocks, etc. 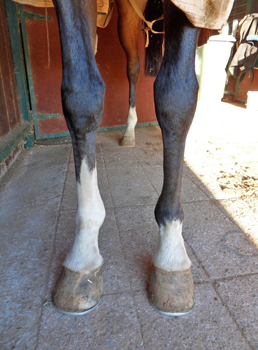 and a diagnosis of a deep bruising in his hoof from the shoes being a bit small. I was told to give him six weeks off. I did ask if the splint could be causing the problem which they didn't think it was much of a concern. The farrier was called and new, different shoes where put on, but neither of us were convinced it was bruising. I continued to lunge him twice a day for ten minutes at the walk to assess his level of lameness. After a week he didn't seem to be lame so I would trot one circle at the end of the ten minutes, then the next day trot two circles, then three and so on. Every few days the farrier would call in to check on him and after another week we couldn't see any lameness. In that time the splint on the off side did get bigger. Missing our first big event we endeavoured to get him right in time for Hobart Royal mid October. The rides leading up to the royal were going good and things seemed to be on track again. Before we left I made a promise to my farrier that if there was any more lameness I would go to the vet that he worked in with. The trip to Hobart went well and the arena over there was beautiful and soft so we thought this might help with any soreness he still may have been feeling. For the two days prior to the classes starting he went beautiful but on the third day he was a bit off, not lame but not right. The morning of his classes he was a bit sore looking coming out of the box, so I saddled up and went up to the arena and did two classes before retiring as he just wasn't right. The next morning we went out for our morning green pick and stretch, a little trot up on the grass showed a real head bob, but appeared to be the other leg. On return home we met the farrier at his vet's clinic for another work up, nerve blocks and x-rays. The x-rays showed microfractures in his cannon bones and a splint coming on his near side fore that wasn't even visible to the eye. So another eight weeks rest was required, especially if we wanted a nice cosmetic result. After four weeks Barry was getting too fat even though we had cut his feed back so it was suggested to swim him. He took to the water like a duck and loved his swims, four times a week. He had been swimming for a month when one morning he walked out of the pool with colic. Two vets and two hours later having every drug known to man we finally got him in the float for a trip back to the equine hospital. He was prepped for surgery and had some blood work done. As we waited and as luck would have it Barry started to pass wind and deflate his belly turning things around for the better. So after several months we did make it to a newcomer event being Barastoc, where he got into the top ten of the Newcomer Large Pony, followed by Dressage with the Stars where he placed second in the four year old class for ponies. At the end of March he was spelled for four months so his leg could have time to settle down as the splint had got rather large. In that time we had tried Dimethyl-Sulfoxide (DMSO), clay poultice, injections of cortisone and magnetic boots with no real results. 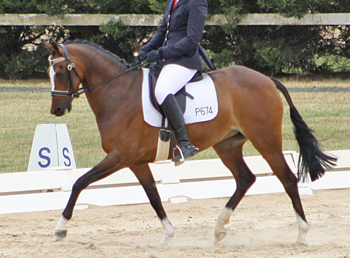 On a trip to Queensland in April I met up with a friend from home and we went looking at a dressage mare that was for sale where we meet a distributor for Gotcha Equine. A discussion on splints, hooves, etc. resulted in her telling me about some products that may help with Barry's splints. Upon returning home I rang Lucy Prior from Gotcha Equine and we spoke for ages on Barry's problems. In the conversation I mentioned to Lucy that when Barry had the colic, his blood results showed that he was very low in calcium which is uncommon in horses. Lucy said that the highly absorbable calcium had been noted by some clients as reducing splints, some as quick as three months. Being desperate to get rid of the splints I thought it was worth a try. Barry started on the highly absorbable calcium and vitamin and mineral supplement in May. Within a month I thought I could see a small change, by two months the second smaller splint had reduced by half and the bigger one a bit less. By the third month the smaller splint had all but gone and the bigger one visibly smaller. Now February, the near side leg is so good you wouldn't notice it by eye and the off side is just a thickening in the leg mid cannon. His splints don't effect him now and I'm sure all the lameness was coming from his splint and I should say that Barry's legs are straight and are not off set in any way. As a show pony you still do get the odd judge that stands in front of you and makes a real point of looking at your legs, but I feel much less self conscious of the splints now. In the past few months he has won Reserve Champion Large Pony at Hobart Royal, a finalist at the recent VAS Horse of the Year and at his last dressage comp in January he scored the highest five year old on the day. Nirelle Somerville - Timmering, Victoria.